I’m trying to recall how I was first introduced to the cooking of Chef Michel Roux. I’ve owned his book Eggs for over ten years, and I believe it came to my attention by way of a Martha Stewart tv show. I remember learning of a lot of cookbooks from her shows. I’ve always loved that book for the attention to detail with each of the classic egg recipes, and the care taken with the techniques is evident in the photos of the finished dishes. Needless to say, I was excited to read a review copy of Michel Roux’s latest book Cheese: The essential guide to cooking with cheese, over 100 recipes . Once again, there are classic dishes that are beautifully presented, and a few intriguing recipes as well. The chapters include Canapes, Soups, Starters and Snacks, Salads, Fish and Shellfish, Meat Poultry and Game, Rice Pasta and Bread, Vegetables, Great Classics, and Desserts, and before getting into the recipes some basic information on types of cheeses and classifications is listed. I was glad to learn about Crique which is a crisp, layered shredded potato cake with Picodon goat cheese in the middle and on top. And, I’d never seen a Pain d’Epices and Cheese Millefeuille. The pain d’epice is sliced horizontally into several very thin slices, and each is spread with a Fourme d’Ambert and butter mixture before the slices are reassembled layer by layer. Here, a fabulous take on Caesar Salad is served with anchovy fillets wrapped around toasted bread batons, and smoked duck breast takes the place of more typical grilled chicken. The Filo Tart with Mediterranean Vegetables and Goat’s Cheese looks like the flakiest, loveliest vegetable tart ever made, and the Parmesan and Fontina Flan would be an incredible accompaniment to ripe, summer tomatoes. 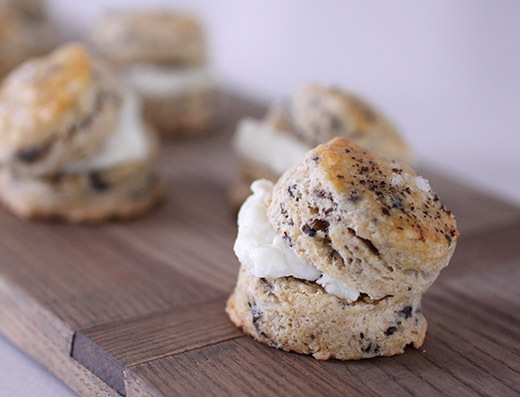 But when I came upon the Brie-Filled Mini Seaweed Scones, I had to start there. I’m an admitted scone-aholic, and when I see something new and different in the form of a scone I have to try it. So, no, I had never made scones with seaweed in them, and I’d never made mini scones that were sliced open and filled with brie. The making of the scone dough itself was the same process as usual. Flour was mixed with baking powder and salt, and butter was worked into the flour mixture before cream was added. 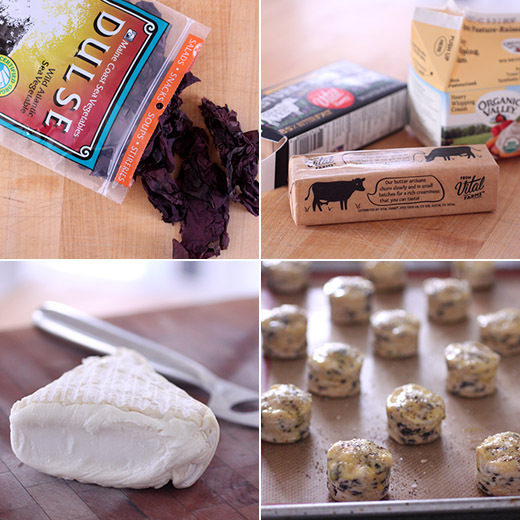 But this time, rinsed and chopped dulse was added with the cream. The dough was patted into a thick disk before being cut into mini, round scones. The scones were brushed with egg wash, and I sprinkled the tops with salt and pepper before baking. After cooling, they were cut about three-quarters of the way through and filled with pieces of brie. My choice for the cheese was a goat brie. With this new book, I continue to be a fan of Michel Roux and the depth of experience that comes through in his recipes. 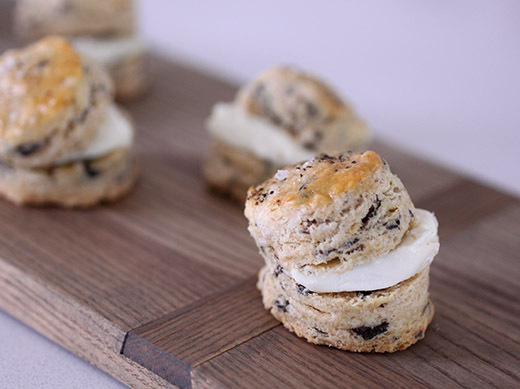 These little scones were as fun as they were rich and delicious. They went well alongside a plate of salad. Next, I’d like to spend some time in the Desserts chapter with a certain Coffee and Mascarpone Creme Brulee. When I read cookbooks, I keep my eye out for ideas both big and small. Sometimes, it’s the little things that can really change your cooking or spark inspiration. And, some books deliver on both fronts. That was the case with Valerie's Home Cooking: More than 100 Delicious Recipes to Share with Friends and Family of which I received a review copy. Valerie Bertinelli gives you the recipes she cooks at home and recipes she learned from her mother and grandmother, and talks you through the why’s and how’s in a friendly, down-to-earth fashion. This is a book of crowd-pleasing food and drinks with a few healthier options, some decadent dishes, and a lot of good ideas for every meal of the day. Egg in a hole is a classic, but I’d never thought of trying it with a bagel and then topping it with Neufchatel cheese mixed with sriracha. The nostalgic Snack Mix in the Happy Hour chapter, made with wasabi peas and broken ramen noodles, inspired me to seek out new and different ingredients for a gluten-free mix to make for gifts. And, speaking of nostalgia, there’s also a homemade Hamburger Helpa and Tuna Noodle Casserole with Potato Chip Topping. Two dishes that got me looking forward to summer produce were the Roasted Eggplant Pesto Pasta and Vegetarian Minestrone. And among the desserts, the Neapolitan Tacos convinced me I need to get my hands on a pizelle maker. Here, pizelles are draped over the handle of wooden spoon so they set in the shape of a taco shell before they’re filled with vanilla ice cream and chopped strawberries. Why have I never made a dessert taco? The ideas shown here started with the Giardiniera Aioli shown in the book with a beef sandwich. I thought it would also be fantastic on an avocado sandwich or as a dip for baked fries. Next, I re-read the head note for the Homemade Baked Potato Tots recipe. In it, there’s a mention of grating cauliflower in with the potato for a slightly lighter take on the concept. 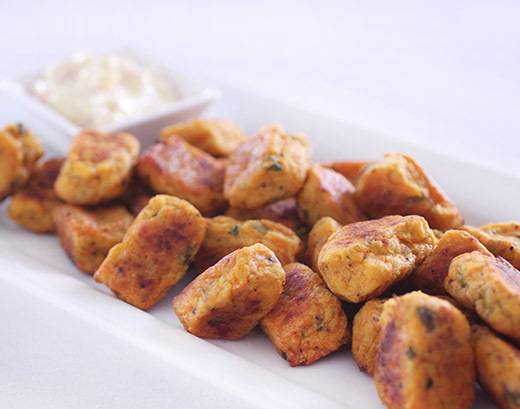 I decided to go one step further and mix sweet potato, russet potato, and cauliflower to make the baked tots and then dip them in giardinera aioli. I had a stash of lacto-fermented giardinera that I made weeks ago with local cauliflower, garlic, and chiles and wanted a really good way to use the last bit of it. This was it. The vegetables were drained from the brine, chopped small, and then mixed into a homemade aioli. 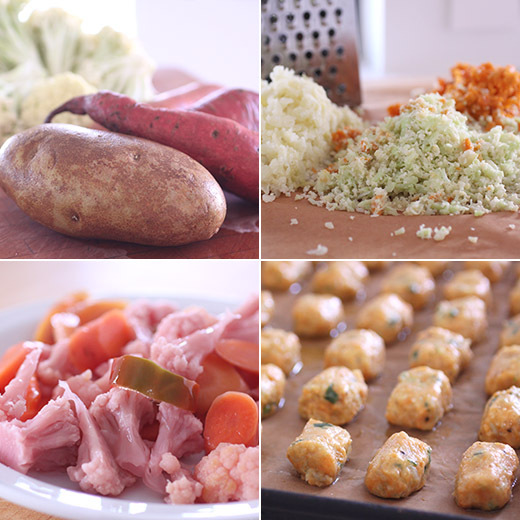 For the tots, you begin by cooking the potato or in my case the two kinds of potato and cauliflower. The vegetables were boiled until tender and then drained and allowed to cool completely. Once cool, they were each grated with a box grater. An egg, some flour, and cayenne pepper, smoked paprika, and salt were added and mixed into the grated vegetables. The mixture was formed into little cylinders, and it helps to moisten your hands. Every so often, I stopped and washed my hands and left them a bit wet before continuing to form the cylinders. I had drizzled some olive oil on a baking sheet, and as each cylinder was formed, I rolled it through the oil and placed it on the sheet. The tots baked for about 25 minutes and were turned halfway through baking. The giardiniera aioli was a revelation. I want that on every sandwich, and I want to dip everything into it now. And, the homemade, lightened-up tots were a lot of fun. 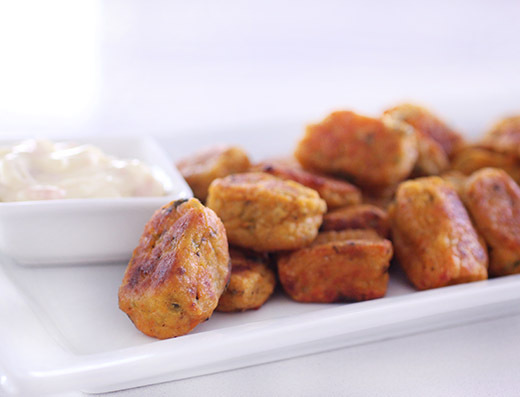 They are tender due to baking as opposed to frying, but they did hold up well for dipping. I could also see them going in all sorts of other flavor directions with added chopped herbs or different spices. Being inspired to try new and different things and imagining all the possible variations is my favorite part of home cooking.